Federal regulations require Investigators to disclose certain financial interests to ensure that the design, conduct or reporting of federally-funded projects will not be biased. In accordance with University of South Carolina Policy: RSCH 1.06 – Disclosure of Financial Interests and Management Conflicts of Interest Related to Sponsored Projects, the financial interests disclosed by USC Investigators are reviewed by the university’s Reviewing Official (RO) and the Conflict of Interest Committee (CoIC). This procedure describes the process by which these financial interests are disclosed by Investigators, and reviewed by the university. The procedure is applicable to all research and educational activities supported by the National Science Foundation (NSF); all research activities supported by the Public Health Service (PHS), including the National Institutes of Health (NIH); and projects sponsored by agencies that specifically require review consistent with federal regulations. Investigator: Means any individual who shares responsibility for the design, conduct or reporting of the results of a sponsored project. Generally, this includes, but is not limited to all individuals identified as key personnel supported on the project. Principal Investigator (PI): An investigator (normally an academic appointee) who has primary responsibility for the scientific and technical conduct, reporting, fiscal and programmatic administration of a sponsored project. Reasonably appears to be related to or is in the same field of expertise as the investigator’s institutional responsibilities. Include all project investigators on the USCeRA Proposal Routing Form to allow for notification and submission of disclosure forms, and notify the Office of Sponsored Awards Management any time that a new investigator is added to the project. For PHS/NIH supported research, annual progress reports (non-competing continuations), actions requesting incremental funding, or no cost extensions must be routed through USCeRA with an updated listing of all investigators. Inform and remind all investigators of their ongoing responsibility to provide initial and updated information related to their financial interests, including annually or when new related interests are obtained during the course of the sponsored project. Complete and submit through USCeRA the Disclosure of Financial Interest Form certifying either that: 1) no related SFI exists; or 2) all information pertinent to the SFI is disclosed as requested. Disclosures must be submitted prior to submission of the proposal to the sponsor. For PHS supported research, a disclosure form must be submitted each time funds are requested including annual progress reports (non-competing continuations); no-cost extension requests; or when incremental funds are accepted under a contract. Submit a revised disclosure form within 30 days of discovering or acquiring a new SFI. Complete Financial Conflict of Interest (FCOI) training as prescribed by the Office of Research Compliance (ORC). Ensure that all personnel qualifying as investigators are included on the USCeRA Proposal Routing Form and that a disclosure form is received from each investigator prior to submitting a proposal to the funding agency. Incomplete routing forms will be returned for action, or SAM may add the names of excluded investigators. Ensure compliance with federal regulatory requirements related to subrecipient investigators by including terms in a written agreement that establishes whether the financial conflicts of interest policy of the university or that of the subrecipient will apply to the subrecipient's investigators. Reviews submitted disclosure forms for completeness and communicates with investigators as necessary to obtain all required information. 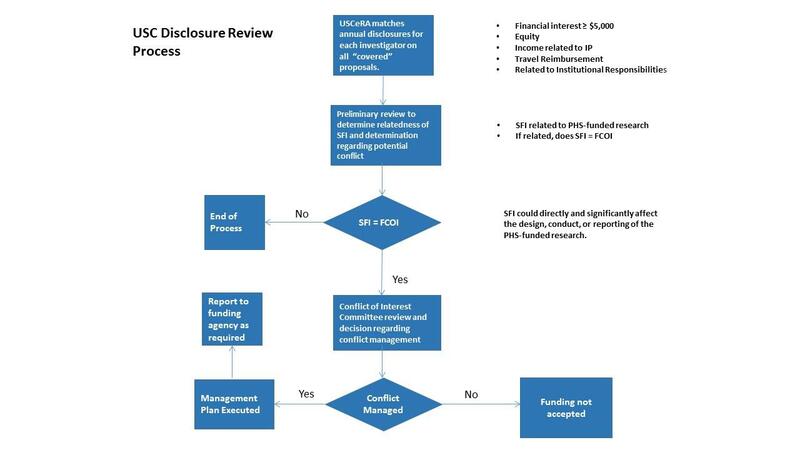 Conduct a preliminary review of all positive Disclosures of Financial Interests to determine whether the reported SFI is related to the research, and if related, whether the SFI constitutes a FCOI. As appropriate, reviews are conducted in consultation with the Chair of the University Conflict of Interest Committee (CoIC). Based on the preliminary review, the following may occur; 1) no further action is recommended or 2) referral to the CoIC for further review. Advise the investigator and the university on how the project must be managed and other actions that must be taken to eliminate the conflict or reduce it to an acceptable level. This is communicated to the investigator in the form of a Conflicts Management Plan. Provide FCOI training to all investigators, and ensure that all PHS funded investigators are trained prior to engaging in research with re-training occurring every four years. Training will be provided primarily through the process of completing disclosure forms, which requires the review of institutional policy and guidance before the form can be submitted. Review disclosure forms and other relevant materials to determine the level and scope of the FCOI. Recommend to the RO actions that are necessary to ensure that any FCOI is eliminated, reduced or managed appropriately. This policy [pdf] is intended to promote objectivity in research by establishing standards that provide a reasonable expectation that the design, conduct and reporting of research funded under externally sponsored grants, contracts and cooperative agreements will be free from bias resulting from Investigator financial conflicts of interest.